In the three major Australian markets across the three main property types, Commercial Property Guide’s Asking Price Index (API) continues to reflect the optimism towards commercial property lease prices. This level of rent growth represents a healthy national annual increase of about 10% p.a. in commercial real estate expectations in March 2018. The index measures the change in asking price rents for advertised properties and excludes the automatic annual increases built into most lease contracts. At the end of February, commercial rents were increasing at a national average of 10% p.a. compared to 5% at the same time last year. Commercial rents for all property types across the major capital cities continue to have an accelerated rate of increase. For the last 12 months, there has been a noticeable surge in commercial rent increases. Commercial property rents are a major component of the business activity. As a result, there is a strong connection between national economic health and commercial property rent expectations. The Asking Price Index captures the expectation of real estate agents and their clients across the nation’s major markets. It is the collective action of industry professionals in an informed market. The main driver of rent increases was the surge in office prices from April 2017 onwards - where office rent was increasing by an average of 4% p.a. to increases in the range of 14% plus in early 2018. Despite all of the media coverage highlighting the impending doom for the retail sector with the arrival of Amazon, the commercial real estate industry was collectively able to place the threat of Amazon in perspective. 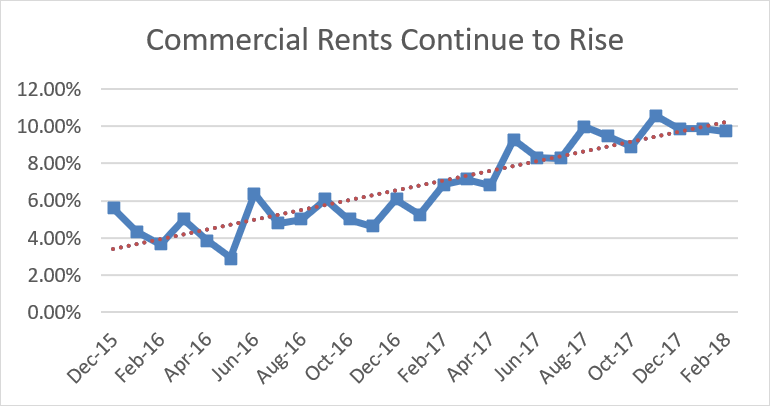 While retail rent increases dropped in April 2017 (probably the peak of “Amazon fever”), early 2018 has seen retail rent increases – starting the year with an 8% rise compared to the previous year. Commercial Property Guide’s Asking Price Index does not include shopping centres. Retail property is not only sought by traditional merchandisers but a whole range of service providers such as restaurants who are not impacted by Amazon. 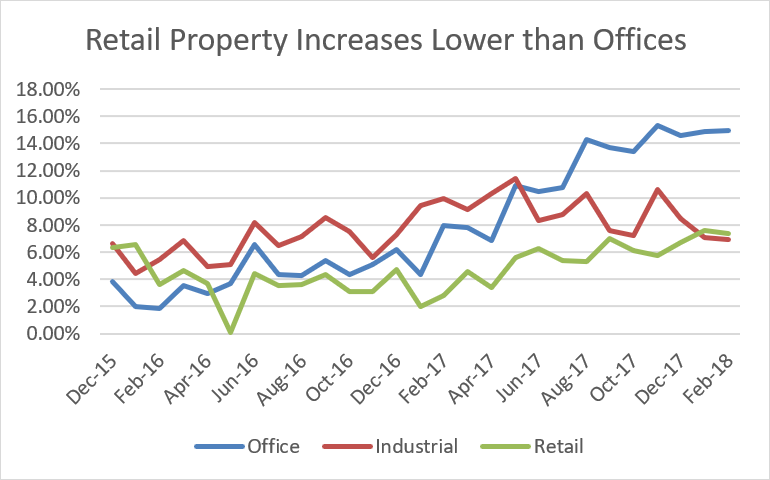 The same phenomena as with many other economic indicators can be seen drilling down into the national commercial rents. 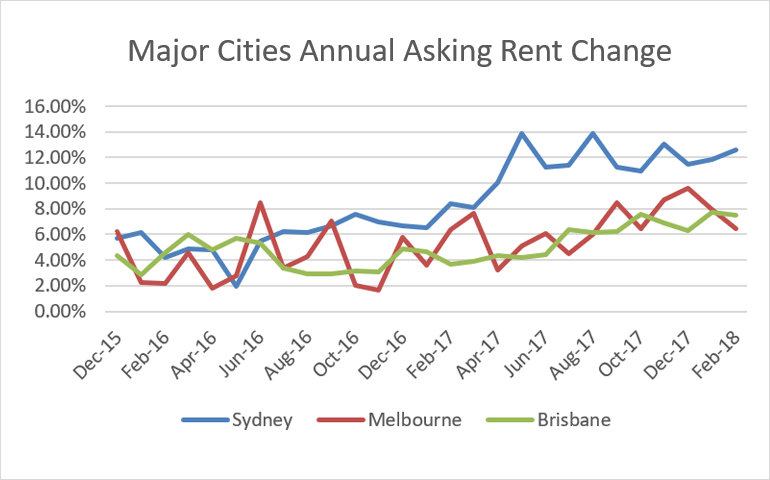 The healthy national increase in commercial rents is driven mainly by Sydney, where its increase of 12% lease price into the first months of 2018, shows no signs yet of moderating. Despite the pessimism of the previous year, 2018 is maintaining its momentum. This demonstrates a mild recovery in commercial lease price increases in Brisbane. 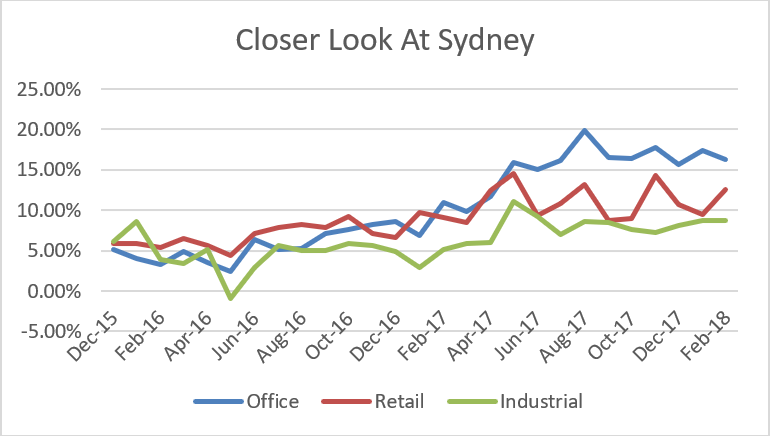 As demonstrated in the graph below, asking prices in Sydney across the three major property types, Office, Retail and Industrial, have a generally optimistic outlook. Sydney office asking rents in the first months of 2018 are 15% to 20% higher than a year before. Its industrial rents also jumped in April 2017 to about 7% p.a. and have been heading towards 10% p.a. increases. Retail which had been following a similar upward trajectory diverged to a much lower value from April 2017 onwards – possibly as the Amazon media impact hit its peak. The Asking Price Index brings together the collective action of hundreds of commercial real estate agents across Australia. The Index is not just one expert’s opinion as to the future direction of commercial real estate price movements, it is a measurement of the change in sentiment of experienced and expert agents who have made tens of thousands of marketing decisions as to the future direction of commercial property. Each week rental prices per square metre are aggregated for each suburb into regions. Those weekly changes are averaged on a monthly basis. Finally, the current rents are compared to those of three months prior and presented as the Asking Price Index.